You may pack your courses with tons of relevant content and awesome visuals, but if they don’t make a dent in the learner’s mind, they have failed in their purpose. It's time to STOP spending long hours working on courses that learners forget the moment they complete the course. You pour much love and sweat into the course creation. 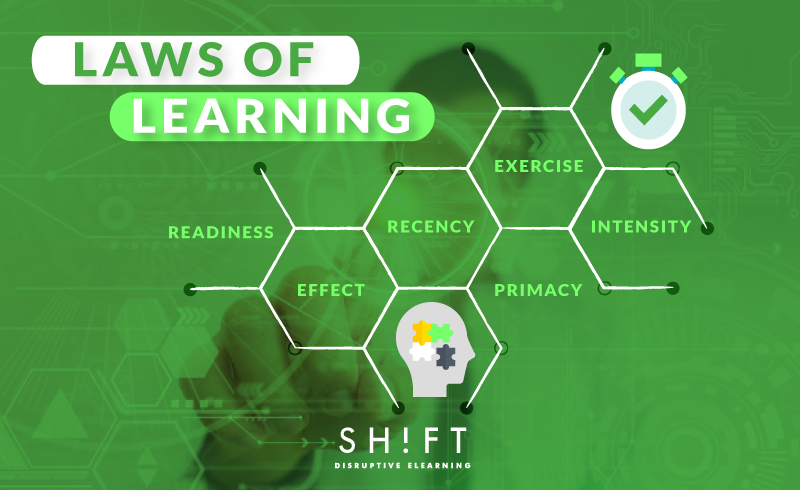 Your courses need to acknowledge the habits and tendencies of how people learn, so the experience becomes relevant, lasting and useful to the learner. Educational psychologists have identified several principles of learning, also known as laws of learning. Make sure you follow these tested principles, you can help your students retain more of what you need them to learn. This law states that learning can only take place when a student is ready to learn. When students feel ready, they learn more effectively and with greater satisfaction than when not ready. Hook the learners before they ever begin the course. This can be done via a pre-work activity or a short video introducing the content. By creating anticipation, you are building learner excitement and motivating them before they ever even access the content. Let students know why it is important to learn a subject and what can they expect from the course. By sharing with the learners what they will learn, you are already motivating the students to meet standards set forth. Be very clear about how the content will be organized and lay out the expected outcomes. This removes some anxiety and begins to get the learners excited about accomplishing tasks set forth. By designing a course that is not only interesting, but gives the student a measurable sense of what can be accomplished, and why, you have followed this law! This law is simple. The more a person practices something, the better he or she is able to retain that knowledge. Remember back in grade school when the teacher would have you write spelling words three times each and then use them in a sentence? Your teacher was practicing this law. Part two of this law states that knowledge not used becomes weakened and disappears from memory. "Use it or lose it" isn't just a random saying: when it comes to learning, it is completely accurate.Your eLearning design should take this into account and provide learners the opportunity to use new information so that it sticks. This means repeating the information, applying it immediately, or connecting the new information to existing knowledge. During the eLearning course provide multiple opportunities for students to go over the material. Add practice problems, mini-quizzes, knowledge checks, summaries and any other kind of review to help achieve this goal. Also, create short, but repetitive exercises immediately after a training course. The constant “recall” leaves a mark and will increase your learner's retention levels significantly. Therefore, we can say students are more likely to learn when they feel satisfied or are rewarded for learning, rather than punished for not learning. They need to feel good in order to retain motivation. Creating an eLearning course that includes rewards for completing portions of the course. Incorporate Q&A’s, discussion forums and social media to encourage learners to interact with instructors and within each other. By using these social tools, you are inspiring empathy and creativity as opposed to passive listening. This allows learners to engage more, retain more and overall get more from your courses. It feels good to achieve something. You should provide feedback to learners regularly about their progress, what they have mastered, and if they have met certain goals. Providing this information will motivate learners as they progress through the course. Spark the right emotions in the learner. If you can connect with learners from the outset – establishing the need for a particular eLearning course, taking them through the course and also, connecting post learning. Not only will you have more rates of completion but also would have enabled a good learning experience. Think back to the time when it was proven that the Earth was round and not flat. The concept was nearly impossible for the majority of those alive to accept. This is because once a person learns something, it is almost impossible to tell them that it is actually different. That is the law of primacy. Your job as an Instructional Designers it to present content in a logical order, step by step, making sure your audience has learned and is ready to move forward to the next level. Preparing and following a course curriculum or outline will facilitate delivering the subject matter the right way the first time. This law reminds us that we remember the most recent (last) material covered. For this reason, you should make a point of including chapter or unit reviews and building on previous knowledge. This gives your students the chance to return to earlier material that may have gotten pushed aside by information near the end of the unit. By creating a review exercise that includes both the older and newer information, it makes it more likely that all the information will be remembered. The more excitement your eLearning course creates, the more likely it will be remembered. Creating a hands-on experience, or one that causes the student to feel strong emotion will make the lesson more easily remembered. Connect the Course With Real Life. We are all flattered when someone shows an interest in us. Right? Flatter your learners and make them interested in what you have to say by showing interest in the goings-on in their lives. The real insights are out there; talk to your audience and peek into their daily lives to find out what challenges them at the workplace. Then craft real-life scenarios that reflect their reality and provide the much-needed context that begets attention. Here's an idea: Develop problems that place the students in real-life situations where they can practice the material. If developing a plan for a small business is the goal, create a fictional small business and allow the students to keep records for the business, including year-end reconciling. By doing the actual work, the students will see how each part of what they have learned relates to the others, and to real-life situations. The more you can make eLearning into a personalized experience, the more learners will take away it. Humans tend to remember events when they find them relevant and when they’re either doing something that has an intrinsically motivational element. Designing with these laws in mind will make you a designer that is valued. Memorize them and include them and you can't lose. Thorndike, E. (1932). The Fundamentals of Learning. New York: Teachers College Press.